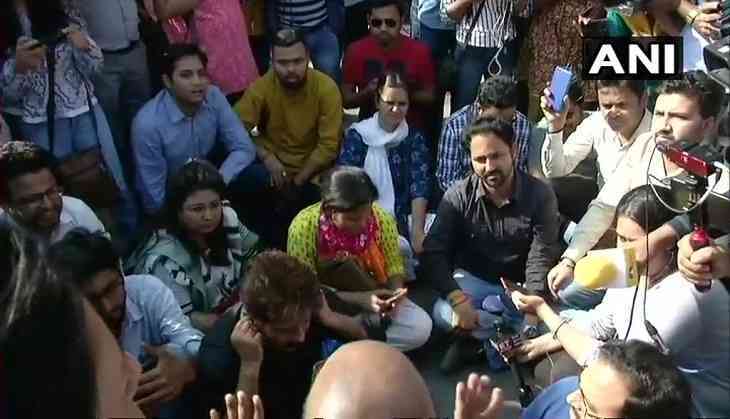 Day after Delhi police manhandled journalist and lathicharged at students, students of Jawaharlal Nehru University is holding a protest against the highhandedness of police at the headquarters of Delhi police at ITO on Saturday, 24 March. There was heated argument between the police and journalists. Journalists put their cameras on the ground and sit in protest outside the Police headquarters. They were protesting against the alleged molestation of a woman journalist by Delhi SHO and manhandling of another journalist by the police. Yesterday, the police reportedly lathicharged at students who were marching from JNU to the parliament against ‘lack of administrative action against Atul Johri, who was booked in sexual harassment case’ and other issues. The police also allegedly manhandled jouranalists who were there to cover the protest. Camera of a photojournalist was broken up. ““I was clicking a student being dragged when the police targeted me. They were talking about snatching and breaking my camera. I kept pleading with them to spare my camera,” said Anushree Fadnavis, the photojournalist of Hindustan Times. “The police assaulted many of the protesters. We were only marching ahead on the route pre-decided with the police. Granting autonomy to JNU means privatization of education and making education out of reach of poor students,” said Geetha Kumari, president of JNU student Union.